Completing your registration to the online casino is an easy process. A new player fills out a short application form, including his/her basic information. Should you run into problems while filling out the form, online customer support is always there to help you. It is important to fill out all information truthfully - the casino may verify the information for transactions or winnings involving greater amounts. Most casinos require confirming the registration e-mail. After doing so, nothing will get into your way of trying out all of the casino games, whether it be for play or real money. To play for real money and qualify for the bonus, a deposit needs to be made to your player account at the casino after registration. Among the standard payment methods are credit card, digital wallet or bank account transfer. These standard payment methods are described in detail below. Credit cards are the most widely used payment method and are making cash more and more obsolete in the real world. The same applies to deposits made to the casino. Deposits made via credit card are easy and quick, and the money is immediately at your disposal on the player account. Many casinos also cooperate with local banks and provide the option of transferring money online - using your bank's internet banking system. This payment method is one of the fastest and most secure. Digital wallets carry your online cash. 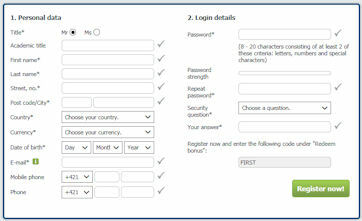 If you do not completely trust the site you wish to transfer money to, this option serves as the security middle man. You transfer the money to your digital wallet from where the corresponding amount is used to pay for products and services over the internet. The most popular digital wallet services include Skrill and Neteller. If you do not trust payments over the internet and do not wish to use your credit card, you can always make a standard bank transfer. Just visit your bank and transfer the deposit from your checking account to the casino's account. This method does have one disadvantage. The transfer takes time, and the casino will only credit your player account upon receiving the money on its bank account. There are more payment options for those not choosing from any of the above. These include using a pre-paid PaysafeCard, or paying via your mobile phone operator. Payouts are just as easy as deposits to your player account. You can have your winnings sent to your bank account, credited to your credit card, or transferred to your digital wallet account (Skrill, Neteller, ...). You can then savour the feeling of winning.